His fur is starting to mat in a few places, his ears are getting floppier, and he even has a few crusty bits. He smells of sweaty baby, sleepy Vivi and freshly bathed mozzi. It’s magical. Bunny has been inducted by Vivi as her lovey and there’s never been a luckier bunny in the entire world. @Nadja, Depending on how floppy they are you could leave on in bed with them? I know I could leave one behind in each of my girls’ rooms. What sweet images! 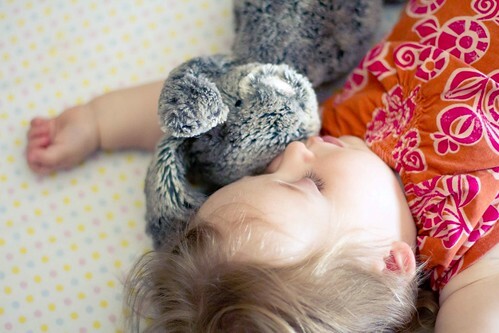 Is there nothing more precious than a well loved stuffed animal? Pink Pig is my daughter’s chosen one. @cheyenna, Addie’s woobie is still going 7 years strong, smelly and slightly gray. I still have all of my kids’ lovies, even though most of them haven’t been used in years. I just can’t bear to get rid of something that absorbed so much of my babies’ love. @Ami, Ah! I never thought of it that way! BABY LOVE ABSORBERS! My daughtrer has a bear she’s had since birth that after almost five years looks dead. His head won’t stand up, and whatever stuffing he ever had is now all bunched down by his feet. But she still won’t let him go. @Fay, I still have my stuffy from when I was 5. He’s got bald spots and uneven fluff but I still love him madly. My boys LOVE all their stuffed animals, There is hardly any room for them in bed. Their favorite “buddy” has a daddy and a grandpa animal too. I am so happy they have special loves with them to keep them feeling safe at night. I just love how serious Vivi looks in her sleep. Eddie has “Lamby” who he calls “Namby”. Someone thought it was the dog toy when they came over not too long ago. @Katie, I have a feeling the cat toys and the baby loveys will soon be confused as well. Awesome. I still have a few of the kids stuffed animals buried away and encased with their childhood. @Always Home and Uncool, I can’t even fathom having to pack up these creatures that are a part of my everyday existence. Can you buy two more? Each child only had one lovey critter, but there were multiple, identical blankies. Thankfully. @Lee Laughlin, I need to, I’ve seen them around and I think I could find more, it’s on my list of things to do. LOVE these shots! Oh, so sweet. My oldest couldn’t care less about a lovey – he’s never needed anything except a bed and a pillow to sleep. My other two, different story completely. My middle son (nearly 3)drags around a Zoobie he’s had since birth.The zipper is broken and the blanket is pilled, but it’s all the same to him. I need to get some shots – you’ve inspired me! What beautiful pictures. I still have my lovey Lamb Pam. Of all her stuffies, I wonder who will be the lucky one to be chosen by my baby girl. That is one very lucky bunny. I hope you have a spare JUST IN CASE.